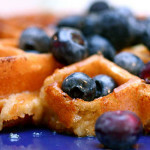 I use my waffle iron three ways to take advantage of how great it is for crisping things. You can cut bacon slices in half, and cook them two minutes per side in the iron. Works great. Or, I shred potatoes and cook those in the iron to make a nest of crispness. Best of all, I make brownies and pour the batter into the waffle iron to get all-over crispy edges. What can I say? I love the food hack.